‘Tis the season for pumpkins and warm spices, even if it is beautiful, sunny, and hot outside here in Northern California. I know it is not so in the East Coast – my friends out there, please bundle up and find a nice cozy spot with a big blanket and a mug of hot cocoa or tea because it seems like this storm will be a big one! If you have all these tasty ingredients in your home, you should get right to baking this delicious treat, it will warm your soul and keep you happy through the storm. Happy soon-to-be Halloween! 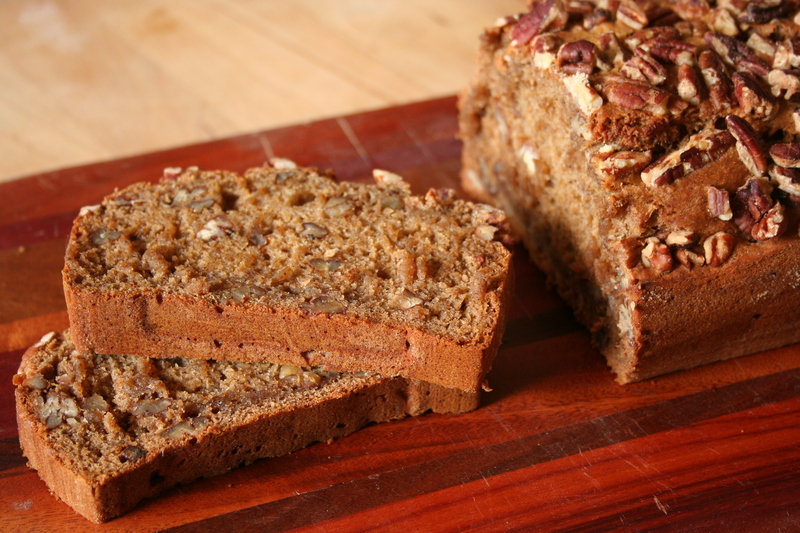 The recipe is based on an old favorite banana bread recipe, which can be found here. Use your electric mixer to mix the ingredients – If you are not using an electric mixer, use a potato masher, fork, or spoon to squish the banana and mix the ingredients together. It is alright for there to be small chunks of banana in the batter, but you want most of the banana to be reduced to mush. If you like, stir in additional ingredients here, such as chopped walnuts or pecans, dried cherries or apricots, or chocolate chips. A handful (about a half a cup) is about right. I used only chocolate chips in my bread. I haven’t updated my blog in forever. I’m so sorry dear readers! Teaching has consumed so much of my time/life/energy/thoughts/dreams/being. When I do leave school, I may still have inspiration for baking but I have few daylight hours to take pictures and sometimes I just can’t bare to be on the computer any longer than I have to, as I crave adult contact and outside adventures! Over winter vacation though, I have had ample time to relax and recuperate, and be outside to my heart’s content. I have baked up a storm, although it wouldn’t seem like it from the small number of pictures I’ve taken. 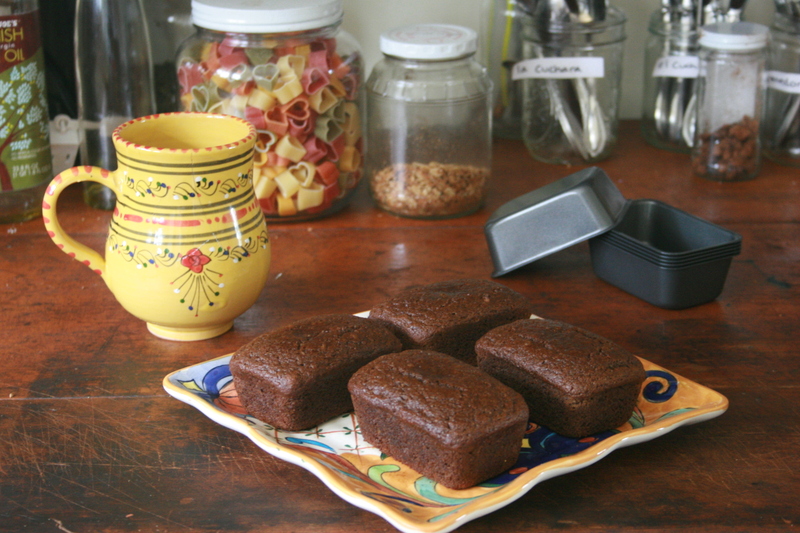 I did capture these delicious Orange Pumpkin Gingerbread Loaves, and I’m happy to share them with you. 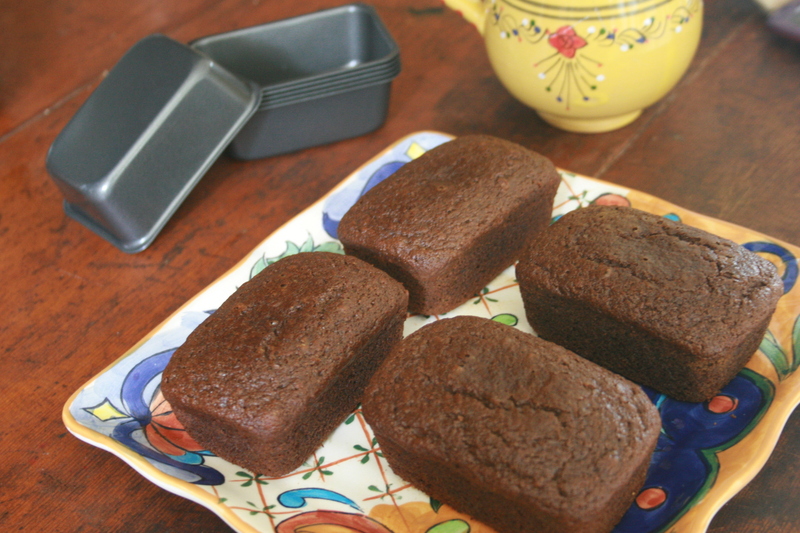 My lovely housemate gave me these mini loaf pans for the holidays, but the recipe is versatile and you can bake the batter into a larger loaf pan or a cake pan if you want. The orange juice gives a nice spicy flavor, and really highlights the ginger. 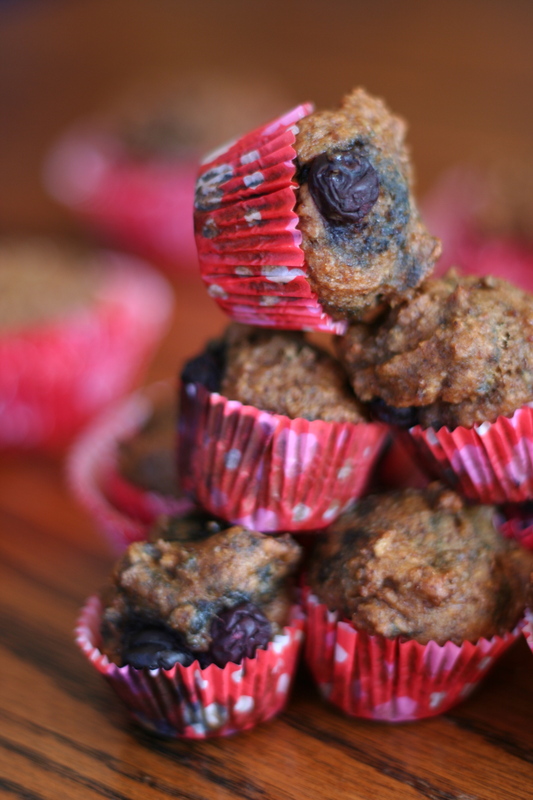 Bake these delicious treats to ring in a sweet new year! Have a happy holiday, everyone! Mix pumpkin and molasses. Add orange juice. Sift together the dry ingredients and combine everything together. Pour into a non-stick 8×8 inch baking pan, or a loaf pan. Bake 60 minutes. Bake the mini loaves for only about 18 minutes. If you stick a knife into the middle, it should come out nearly clean but not quite – you want it to be a little sticky. Spring is here! It makes me simultaneously incredibly joyful and a little bit sad. It makes it really difficult to study, teach, and sit in class while it is warm and sunny outside…So I plan on making this post quite short in my effort to stay on the computer and inside as little as possible when I don’t have to. Last week, we had gorgeous weather, and this week it’s looking and feeling beautiful again. However, last Friday was colder, grayer, and rainier, and of course this was the morning that I had off to play. 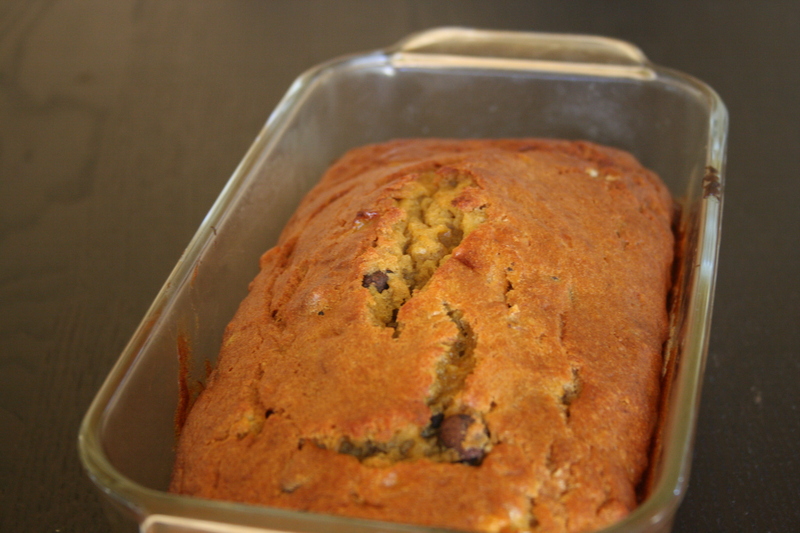 My friend Zoe had fortuitously given me some ripe bananas the evening before, and so, instead of playing, I baked this spicy, moist, fragrant, and ultimately overall delicious Banana Bread. I made two variations; one with chocolate chips, and one without. Both loaves had pecans mixed in. Feel free to throw in whatever other add-ins you prefer. You can also use all agave or all maple syrup instead of the combination I used; just think about what flavors you want to bring out. I brought half a loaf of each variation to my afternoon class, with the intention of slicing and freezing the rest to keep for a future treat. Instead, I (and friends) ate it all within two days! Since there is no refined sugar (except in the chocolate chips) and no oil, it was a delightfully healthy study-break snack. I wish I could keep enjoying it, but alas, it is all gone. 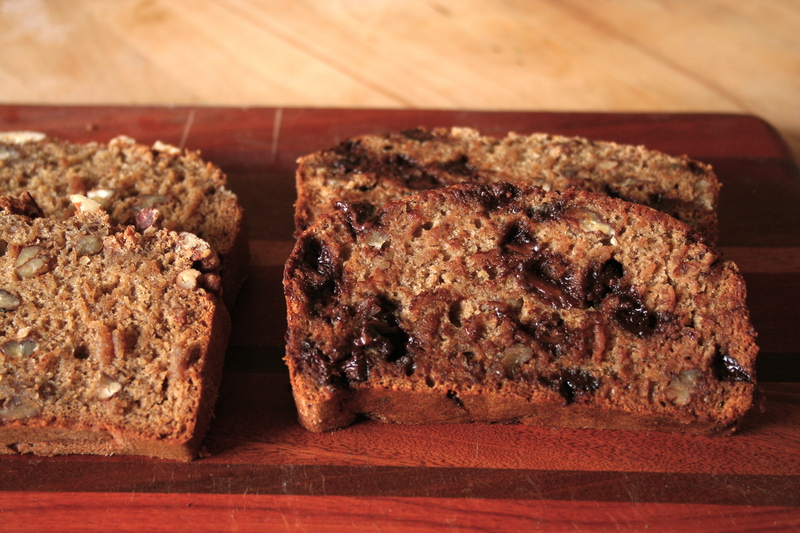 Anyone have bruised bananas that they want to gift to me so I can bake more? Preheat your oven to preheated 350°F. Grease and flour a loaf pan. In a medium sized bowl, mash bananas with Agave nectar, maple syrup, applesauce and vanilla until combined and creamy. In a large bowl, sift together flour, baking soda, baking powder, cinnamon, cloves, and nutmeg. Add the wet to dry. Sprinkle in nuts and/or chocolate chips, and stir batter until just mixed. I don’t usually use baking mixes, but I had this one on hand and wanted to make a last-minute treat, so I whipped it out and set out to make it. 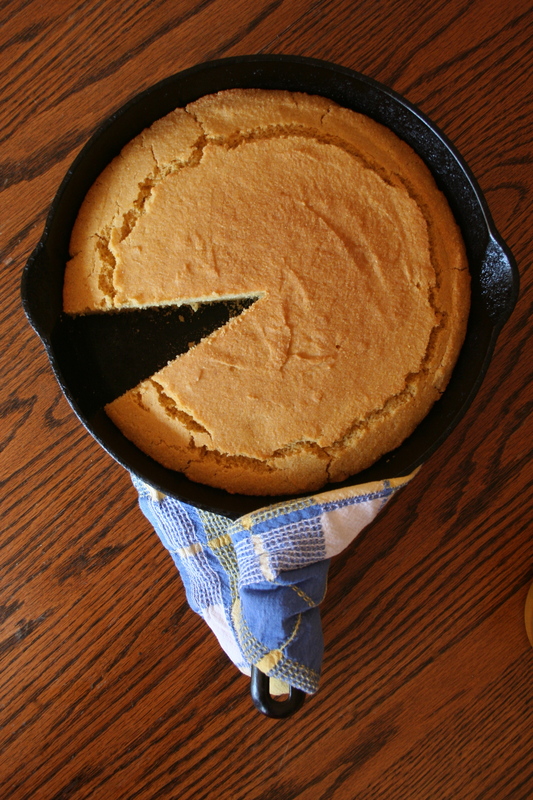 It turned out moist, crumbly, and had a perfectly crispy crust because I baked it in a cast-iron skillet. 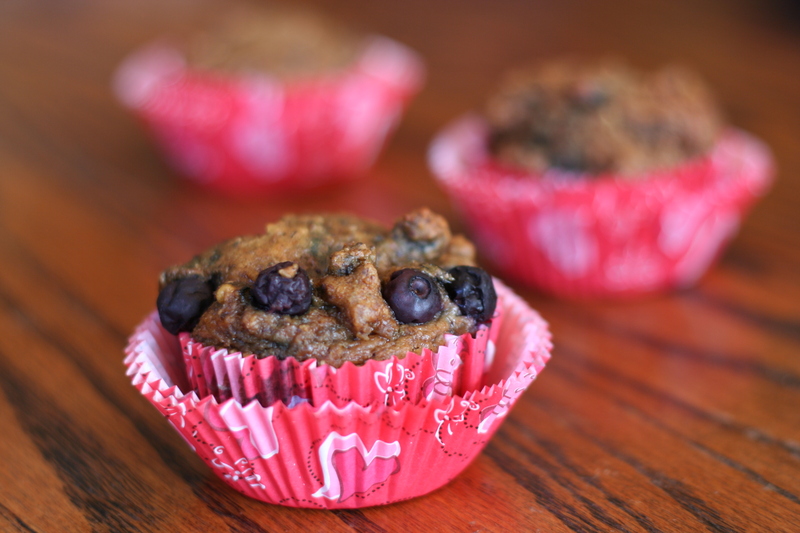 The mix I used was from The Cravings Place, and it was gluten-free, vegan, and sugar-free (and super fast and easy!). The instructions suggested adding sugar, honey, or maple syrup if you wanted a sweeter bread…I had an inner debate about this, and ended up adding only about 1/4 cup of maple syrup. Lightly sweetened this way, the naturally sweet cornmeal flavor really shone through the bread and made for a wonderful appetizer. 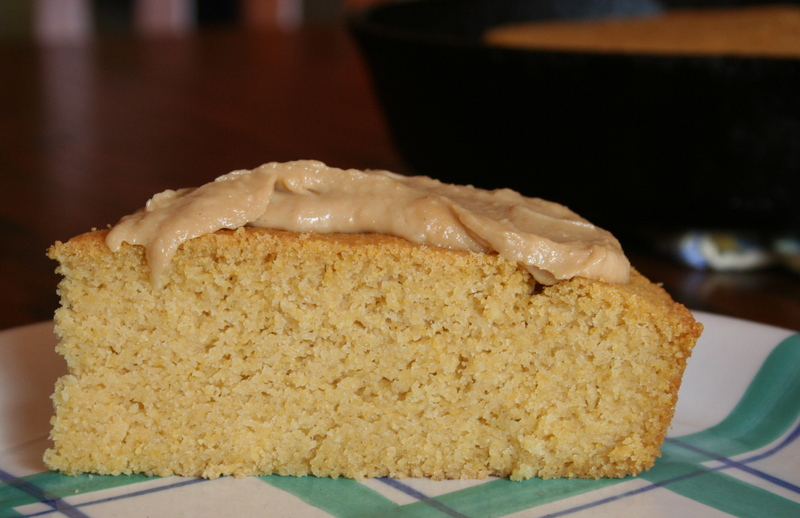 I made a Miso-Tahini Spread to go on top, using a recipe from the Angelica’s Kitchen Cookbook, which made the cornbread a little more savory. 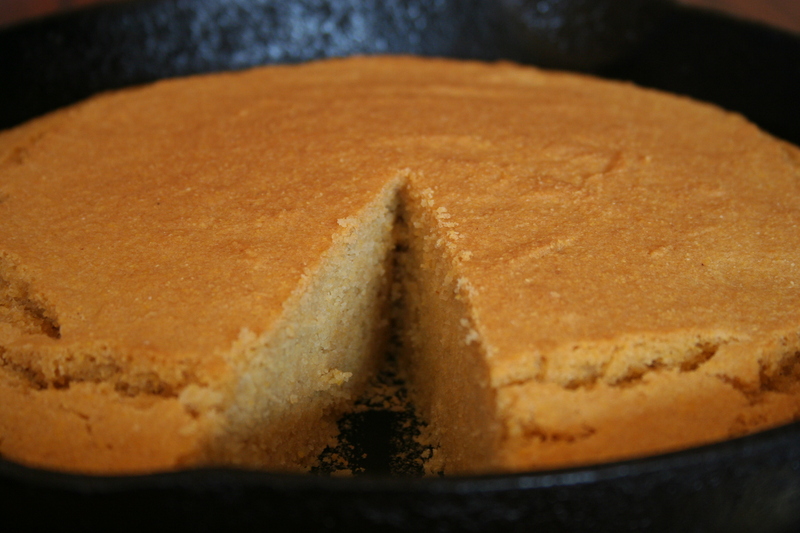 Good vegan and from-scratch cornbread recipes that I have tried before have been from the same Angelica’s Kitchen Cookbook, as well as Peter Berley’s cornbread recipe (these recipes are very similar, as Berley developed many of the Angelica’s recipes). While neither of these recipes are gluten-free, they could be easily adapted to be by substituting rice flour and xanthan gum instead of the wheat flour. Combine the miso with the water in a food processor. Puree until creamy. Add the tahini, and process until smooth. Spread liberally on top of your cornbread, crackers, or anything else you might want a savory topping on. I got the idea for this bread from Dorie Greenspan’s fan site “Tuesdays With Dorie” where blogging fans choose a specific recipe of Dorie’s to make each week and then they all bake the same thing and post about it. So it’s kind of like baking together, from all over the world! One such recipe and post was for Dorie’s Fresh Mango Bread. It looked moist and crumbly and delicious. So I had to veganize it and try it out! 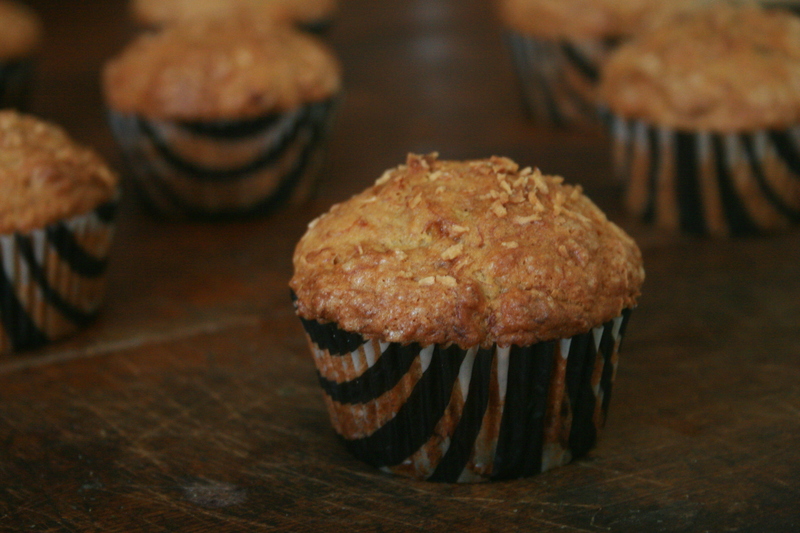 My version was certainly moist and crumbly and delicious, but perhaps a bit too moist and crumbly! Next time I will try to cut down on the wet ingredients a bit and turn the oven temperature lower (and increase the baking time) so that the inside cooks more. 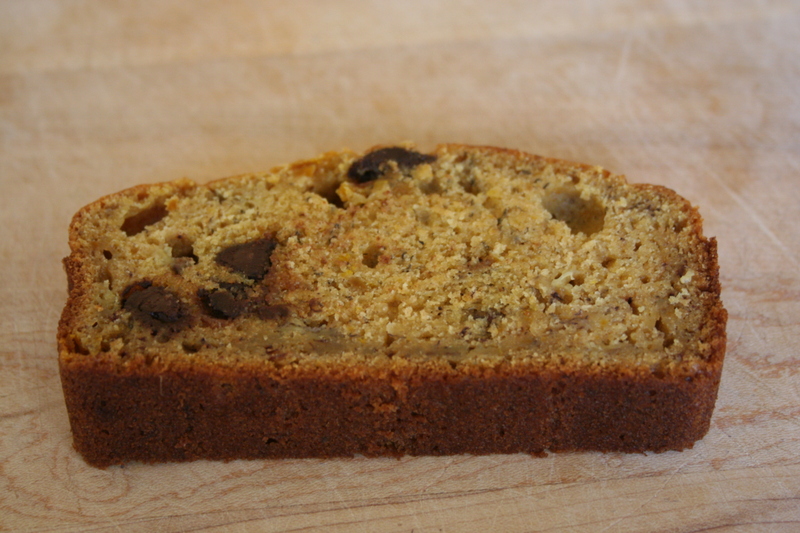 The inside was moist and pudding-like, especially with the chunks of gooey mango and chewy raisins. The inside firmed up a bit by the next morning, and it was actually quite a nice soft texture. I liked that the outside had a bit of crunch to it. And the taste! Yum. All the ginger and cinnamon spices were delightful, and the lime juice adds a lovely zing. It’s sweet but not too-sweet, was a great dessert cake (with a scoop of vanilla ice cream it would be divine! ), and also was a great breakfast cake. Come on, admit it, you like to eat cake for breakfast, and this one is actually mildly healthy (just forget all the white flour, sugar, oil, etc. But it does have fruit in it! So that counts for something, I’d say). I’ve written out my adapted recipe below; You can choose to lower the oven temperature or the amount of liquid if you want to. Center a rack in the oven and preheat the oven to 350 degrees F. Grease an 8.5 x 4.5 inch loaf pan, dust the inside with flour and tap out the excess. Put the pan on an insulated baking sheet or on two regular baking sheets stacked one on top of the other. (This extra insulation will keep the bottom of the bread from overbaking). Whisk the soy yogurt and oil together. Add the sugars and continue whisking. In a large bowl, whisk together the flour, baking powder, baking soda, spices and salt. Pour the wet ingredients over the dry, switch to a sturdy rubber spatula or wooden spoon and mix until blended — the batter will be very thick (really more like a dough than a batter) and not easily mixed, but persevere, it will soon come together. Stir in the mango, raisins, zest, and lime juice. Scrape the batter into the pan and smooth the top with a rubber spatula. Sprinkle the coconut and chopped cashews on top. Bake the bread for 1.5 hours, or until it is golden brown and a thin knife inserted into the center comes out clean. (If the bread looks as if it’s getting too brown as it bakes, cover it loosely with a foil tent – shiny side of foil facing up). I did this at 45 minutes. Transfer the pan to a rack and cool for 5 minutes before running a knife around the sides of the pan and unmolding. Invert and cool to room temperature right side up on the rack. Let cool completely before slicing.